← Happy Coconut Cream Pie Day! Blackcurrant at the mini mart…. You just never know what you’ll discover at the mini-mart checkout. In Idaho you can get home-made jerky and pickled eggs, in Maryland you get Swiss-made pastilles. One of my favorite flavors is blackcurrant, and that’s what sold me. The antique-style of the tin was also a factor in my purchase since I have a soft spot for old-time graphics. I’m about 2 steps away from being a hoarder…. I failed to see the price of $9.95, so my expectations were high….and they were met. 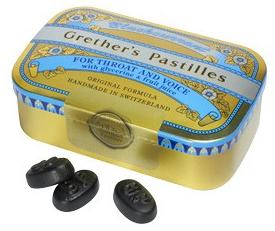 Grether’s Pastilles are a delicately flavored candy, with a chewy texture, like the old Pine Brother’s cough drops. They say that these are throat drops, but I didn’t notice any soothing qualities, just a sweet taste. The production time takes 3 months for the flavor to ripen, maybe this explains the $9.95. I will buy them again if I can find them for a cheaper price, otherwise, I’ll just keep my pretty tin as a reminder. I love these too!!! I first had them in NYC from Dean and Deluca, I first bought one each of the Blackcurrent and Redcurrent, didn’t try them till I went home to Ohio. Boy I was sorry I waited, the next trip to NYC I bought 5 of each, I made each tin last me a month so by time I was out I was going to NYC again…ha ha ha oh some of the silly things we do for our favorite things!!! Thank you for sharing!!! Thanks for reading the post, it made my day!